Celtic coasters along with the matching holder will be a great addition to you Irish home or pub. 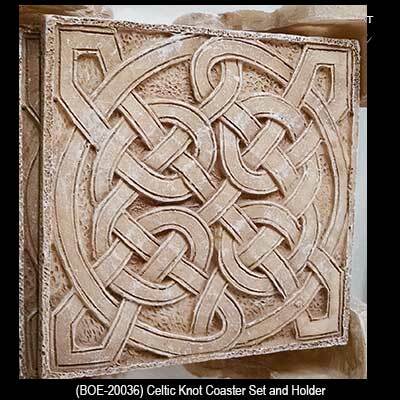 These Celtic coasters and the holder have the look of stone, but are made of resin. This set of Celtic coasters includes 6 tan beverage coasters with Celtic knots and a holder with a complementing design. The Celtic coasters measure 3 5/8" square and the holder measures 4 1/4" x 4 1/4" x 2 1/2" tall. These Irish coasters and the holder are made of resin and feature padded feet. 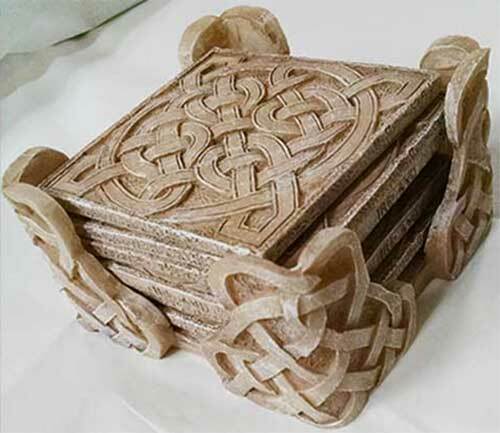 The set is received boxed with a Celtic knot history card, complements of The Irish Gift House. Irish coasters are made of slate and feature the shamrock and Celtic Trinity knot along with the Claddagh and the harp. Irish coasters feature a pub design that is enhanced with a shamrock. Irish coasters feature the Gaelic word sláinte along with distinctive Celtic knot-work. Irish coasters with Celtic knots features an Irish blessing that is continued with each glass coaster. Irish coat of arms coasters feature your name as the owner of the establishment and are complete with a wooden stand.